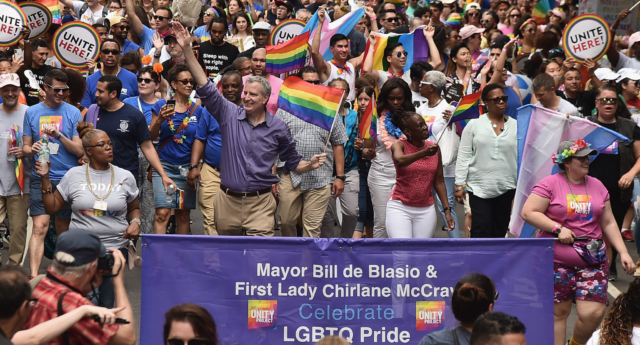 People living in New York City can now select a third gender on their birth certificates, after new legislation came into effect on Tuesday (January 1). Bill de Blasio, mayor of New York City, said the measure was introduced to make the city more welcoming for trans and non-binary people. “Transgender and gender non-conforming New Yorkers deserve the right to choose how they identify and to live with respect and dignity,” he reportedly said in a statement. New York City residents can now choose between three gender markers on their birth certificates: M, F, or X. A bill for the new legislation was passed in September and was later signed off by the city’s board of health. The move makes New York one of the few US cities where people can identify as being gender non-binary, with California and Washington state having previously made similar moves. “People born in NYC can now change the gender marker on their birth certificates to ‘X,'” posted the New York City Department of Health and Mental Hygiene on Twitter. The new legislation is also expected to make it easier for New York City inhabitants to change their gender. It comes shortly after Germany’s parliament introduced a law in December, which will add a third gender to birth certificates for people born intersex. The blank option on forms, instituted in Germany in 2013 as a Europe-wide first, has been replaced with a “diverse” option for newborns whose sexual anatomy does not fit the binary male or female, according to The Local Germany and Deutsche Welle. Intersex people will also be able to change their gender and first name on birth certificates if they feel they were assigned the wrong gender at birth, though this will usually require a medical certificate.